the secret to saving money in college! Though I now consider myself to be a very thrifty person, I have to be honest and say that I really didn’t become that way until I began college! The phrase, “broke college student”, is pretty well known in reference to college kids and as expensive as school is these days.. it’s understandable. College was the time where I really started to understand the value of money and how to properly budget. Though I wasn't totally thrown to the wolves ( Thank you mom! ), I had to take on a lot more responsibility financially. As I mentioned in my 9 ways to prepare yourself for life after college! post, learning how to be smart with money right now will save you a whole lot of stress after graduation. 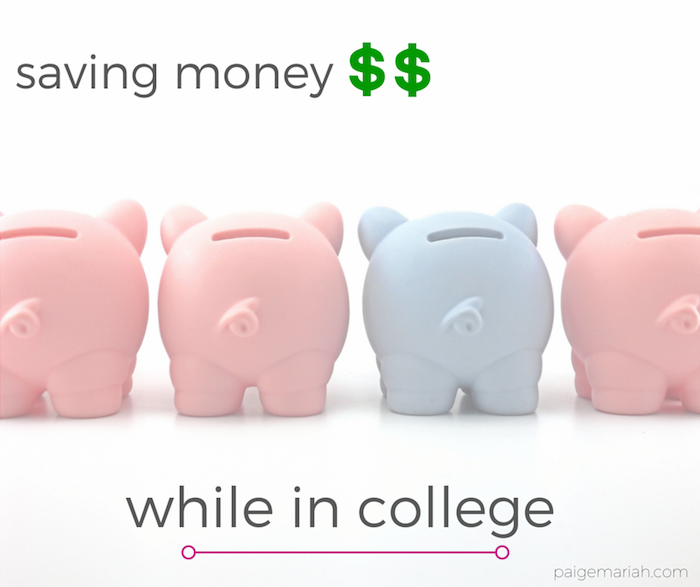 Here are a few of the ways that I saved money and made more thrifty decisions while I was in college! Do your own mani/pedi: While I was in high school, I literally got my nails done every 2 weeks. ( I don’t know how my mom ever went for that!) In college, I decided to start painting my own nails rather than paying for consistent full sets/fill ins and I actually began to look forward the little me time that I put aside for it! If I hadn’t of started doing them myself, I would have never known how long and healthy my real nails could actually grow. To this day I still prefer to do my own nails and putting that money toward other things like clothes :). Paying other students for services: If you haven’t already figured it out, almost everyone on campus has a side hustle to make extra cash. It’s actually one of the things that I miss most about being on campus. You could literally find someone to replace your cracked IPhone screen and do your sew-in in the same dorm/apartment complex! There are so many talented hair stylists on college campuses that charge way less than hair salons, as well as people doing many other services like technology repair and photography. Of course we don’t want to take away business from the professionals but hey…we have to support our fellow students too! Buying groceries/eating at the cafeteria rather than eating out: This one was probably the most difficult for me as a student, hey, it’s actually still pretty hard now. Though it’s fun to always go out for drinks and food with your friends, you should really try to limit it to once or twice a week and take advantage of your cafeteria or buying groceries. Hampton’s cafeteria wasn’t the best when I had a meal plan, so I had an excuse :), BUT I definitely tried to do better once I moved into my apartment. Groceries last a lot longer and way are a better investment than going out and spending money on every single meal! Buy used/rent text books: I really hope that every college student is already doing this! I saved so much money renting my books from sites like Chegg and Amazon rather than purchasing new books from our campus bookstore. You’ll only be using these books for a semester anyway, so let’s make this process as painless and affordable as possible! Thrift store shopping: If you’re a consistent reader of my blog, you have to know how much I love shopping at thrift stores. My obsession definitely began in college when I just couldn’t believe how cheap I could get things that were so much more expensive in retail stores. Thrifting is definitely the solution to building up an awesome wardrobe for less! Sell things that you aren’t using: Now this isn’t exactly a way to save money but a way to make it! When it was time to move out of my apartment after graduation, I was left with a bunch of clothes/stuff and no way to get it all home on an airplane. I decided to create my own little thrift store and sold clothes on a clothing rack right out of the living room of my apartment! It was super convenient for me and a great way to make some extra cash. What are some ways that you saved or are currently saving money while in school?